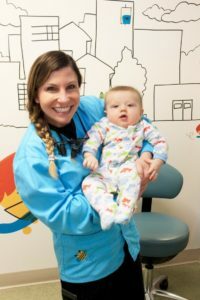 Most parents have never heard of the term “tongue and lip tie” or “tongue-tie” so when a pediatric dentist or pediatrician mentions their baby has it, it can be very overwhelming. It’s important for parents to understand what it is and how to treat it, so the article below explains what parents need to know about tongue and lip ties. Tongue-tie, professionally known as ankyloglossia, is a congenital condition in which the tongue or lip frenulum is too tight, causing limitations in movement that can cause great difficulty with breastfeeding and, in some instances, other health concerns like dental, digestive and speech issues. Mothers of infants dealing with feeding challenges are often anxious to find solutions. The condition is present at birth. A short, tight band of tissue tethers the tongue’s tip to the floor of the mouth. It can affect how a child eats and speaks, and can interfere with breastfeeding. The condition is more common than most people know. If the issue is serious enough, these issues, as well as others, can continue for years and even into adulthood, causing issues such as speech issues or dental problems, so it’s always a good idea to consult with a medical professional to see what options are available for treatment. How do parents know if it’s serious enough to see a doctor? There are times when surgery is necessary. The consequences of an untreated tongue tie can be many and varied, depending largely on the age of the child and the severity of the condition. The demands made on us increase as we grow older, and our environment becomes less forgiving of mistakes. Delay in treatment, therefore, can have very negative consequences. Contact your doctor or pediatric dentist for their opinion. They can explain all the treatment options to you. Every case is different which is why it’s important consult a doctor or pediatric dentist to find out the best options for your child. As a pediatric dentist, I have worked with this condition before, with very positive outcomes. Here’s a great story of a child I worked with, what the parents were experiencing, and the ultimate outcome. Lip and tongue-ties are a fairly common condition, yet one that is misunderstood and misdiagnosed often. Understanding what parents need to know about tongue and lip ties can help them make an informed decision and do what’s best for their child.